If you have been following my blog for some time now, you must have heard the 100 million times I have mentioned being too busy or too rushed with too much to do in too little time. If I hadn’t written those blog posts, I probably wouldn’t have noticed this pattern, but when I put it down in writing, I just couldn’t escape the reality of what my life had become. Don’t get me wrong, I wasn’t ever lying. I was indeed pretty busy. And it wasn’t just the ‘routinely busy’ kind of situation either. We were going through some major life changes. I joined the corporate world after a break of 6 years. It was something that I had wanted to do from a long time, but when it actually happened, it was quite the adjustment. We had to essentially move out of our comfort zones and figure out a new way of doing pretty much everything. A few months after that, we bought & moved into our very first house in the US – a completely novel experience for us, which filled us with a lot of joy, but equally overwhelmed us. Everywhere we looked, there was too much to do. Then when we were barely getting settled in the new house, we got the news that my sister was getting married in a few months. And while that might not seem like a big deal to many of you, trust me on this – Indian weddings are quite the production, with a lot of moving parts. Moreover, the wedding was going to take place in India, which meant we had to work out the logistics of an India trip, which (if you are an NRI you know) is a mammoth task in itself. Long story short, I found myself in an eternally busy state, where I did not have the time or energy to do anything beyond the things that had to be done, like the day-to-day chores, so I ended up procrastinating everything else – even the things that were important to me – from relatively smaller projects like wanting to sort and organize the family photos, to planning family vacations, starting a food blog…this was a long list. In my mind, I could always do them later, when I was relatively free (ha! ), or when I had more time to focus on these “extras”. But these undone things were important to me, so even though I procrastinated them, they were never out of my mind, which left me with a constant feeling of dissatisfaction. Then, last week, as I was randomly sifting through my work records, I saw that I would be soon completing a year at my current workplace. That took me by surprise; as in my mind, it did not seem possible that a whole year could have passed. This little fact also made me realize that it had been one full year since this cycle of being busy had started. One year since I thought that I could do those tasks ‘later’. And now it was ‘later’, but nothing much had changed, here I was, still as busy as ever, this time busy figuring out home decor, gardening, and researching big and small home projects; still procrastinating the same things as last year, still equally disgruntled with myself (if not more). I can’t tell you how hard this realization struck me. I knew I had to make some changes, as I could not expect different results if I did the same things over and over again. I had to figure out a way of living my life, without procrastinating the things important to me, while still doing what needed to be done. Because the last thing I wanted to do is to have life pass me by, while I obsessed over being too busy, and not having enough time to do anything. Which is why, I have now decided to get better at keeping my priorities straight, while striving towards maintaining a good balance, between what has to be done, and what I want to do, and accomplish a little bit of everything. My quarterly goals are definitely helping me with this, but I know this balance is something that I would need to strive towards every single day, and going forward I will. Because I owe it to myself. That’s all from my end folks. I would love to hear from you guys. Have you guys experienced something like this as well? Felt like you lived in an eternal state of ‘busy’? What did you do to overcome it? Do share! 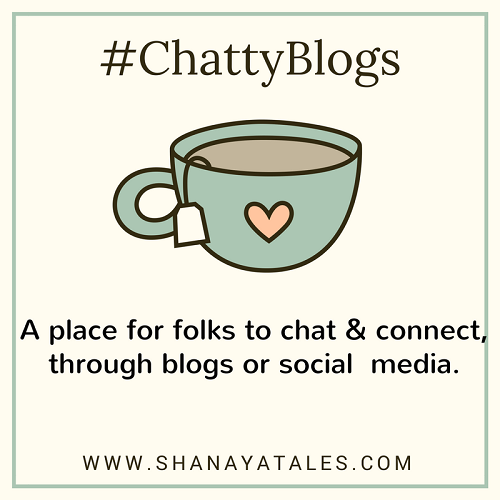 The #ChattyBlogs Linky: A monthly linky which goes up on the first Sunday of every month, and is open for 2 weeks. Write a chatty/rambly post – it could be a deep, thought-provoking one or even a random ramble. No judgement here. 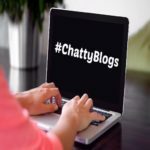 At the bottom of your post – add the #ChattyBlogs badge, and link to this post (which hosts the linky) to encourage other bloggers to join in. Add your link to the #ChattyBlogs linky. Visit and comment on the fellow bloggers’ post in the linky. Note: I have also created a twitter handle for ChattyBlogs & registered the actual hashtag #ChattyBlogs. So, when you do write and link up your posts, please do use the hashtag & I will be sure to RT & share it. So many things to love here and I’m so glad to see this linky! I’ll be sure to link up this week. I wish you all the best in this. May you be able to do all those things which are really important to you, yes, only you because I know how important those are to keep us sane despite our busy routines. Nabanita recently posted…#FeministMondays | Why Are Women Paid Less? Thank you so much, Naba, and yeah that’s very true. In-spite of how busy life can get, these are things I need to get done for my own sanity. Congratulations on all the new beginnings. Time flies when you’re having fun, is what I’d say. I know it get overwhelming , doing so much, but hey, you did it! You superwoman you! Now I know why you were missing Shantla – I have missed reading your blogs a lot! First up congrats for completing a year back at work after a hiatus – its not easy!!! The wedding pics were stunning and I plan to link upto this in the coming week as I have a long rambling post in mind, courtesy an unpleasant incident which relaly got me thinking about friends and foes alike!! SHALINI BAISIWALA recently posted…Save me from these Mother India please!!! Thank you so much, Shalini. Geetika recently posted…Are you the Change? Thank you so much, Lisa. And yes, it’s mostly all good stuff, which I am immensely thankful for. As for the rest, I am learning to pace myself, and give myself some grace for all the things I am not able to get to. It’s like you pulled all of that right out of my mind. At least we’re never bored. Later is now and I should get busy. Hahaha..Indeed – Later is now! Lovely to hear your “voice” again, Shantala. Wow, what a flurry of activities this last year has been for you! So glad they’re all good ones 🙂 I hope you’re carving out at least some time for yourself, even if its a few minutes. Don’t tell me it’s a year since you back to work. Really? Where did the last year go? 😉 Coming to the topic – I totally get your point. When we say later, we just push it and then realise it was important. Then why did we push it to later? Ha! Oh yes, it makes sense. I like your idea. Hunkering down on short term goals is definitely easier to handle. This happens to me too. Procrastinating many important things and feeling disappointed at last. All the best for your goals Shanaya. I totally understand where you are coming from, Shantala. I think it is okay to let go a little when you have so much on your plate. I do that sometimes when I feel overwhelmed. Then it makes sense to prioritize and not feel guilty for missing out on the other stuff. From whatever I read on your site, you are quite disciplined. Having smaller goals month-in-month or even fortnightly help. Also don’t overreach. Only have goals that are realistically doable within the 24 hours you have. Good luck and hope you achieve whatever you are aiming for. Thank you so much, Rachna, and yes that’s very true. I am working on having realistic goals and to-do lists and breaking them down in smaller chunks. You spoke my mind, Shantala. I too recently completed a year at work and while I love my work, there are times when I find that I’ve stopped doing my favourite things like practicing music or writing for myself on my blog. I can’t entirely blame my work for I’ve found out that on days when work is less hectic, I’m not working on what I love doing. I lack the drive to remain focused and organized. Aiming to do a post a week but I need to push myself to do that. All the best to you, Shantala. Wow, one year! That’s fantastic, congrats! Goal setting always helps. It happens to me too, how I set aside things for later, and then realize later has become way too late. These tiny changes that we make for ourselves really help set all of it straight – to some extent at least. Congratulations on completing a year at your job! It sounds like you’ve had a particularly packed year…hope you are able to focus on the tasks that matter to you. Goals and time chunking really helps! It’s interesting how the busyness can just take over our lives completely. I’m guilty of the same but I only have myself to blame for working more than 50 hours a week. It’s ridiculous! Hope you find your balance soon. Thank you, Sanch. And oh my God! 50 hours! You need to slow down girl! Yes, we need to keep rebalancing priorities .Loved the idea of chatty blogs !It’s almost like a kitty party, just on the blog. Congratulations for completing a year in your workplace. This happens to me too. I can’t believe already its mid of May. This year is flying away too quickly. Wow, Shantala didn’t know that you have been on the job for a year! Awesome! And congrats. We all have that long list of to-dos, don’t we? I made my bucket list last week and I am trying to at least attempt to do them one at a time. Hey, I will join with my chatty post this weekend. Do I have time till then? You certainly were busy, Shantala, and you’ve done a fab job of blogging when you can. It seems like life will now settle into an even pace for you. Wishing you the very best always! Will all your “busy” I think you’ve been amazing all around! Fab photos of your sis’s wedding on Facebook, Shantala! Congratulations on your return-to-work anniversary and your new home! Wishing you much happiness! Love to you! Shantala, I loved your wedding pics and the attire. Congrats for the new job and new Home. What matter is to never give up. Things will fall in place soon, don’t worry. You reminded me to write my quarterly goals post. Was busy doing A to Z and then e-book. So many congratulations are in order Shantala. I’m glad you made time for kicking off chatty blogs. There’s still a day to go and I’m hoping I’ll come ups with a post. My presence has also been sporadic over the past month. Vacations seem to upset my schedule.